This article is about sequence for the Mass for Pentecost. 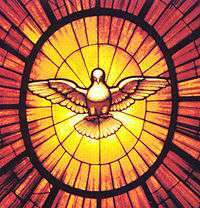 For prayer which has a partial indulgence attached to it, see Come, Holy Spirit. Not to be confused with the Latin hymn Veni Creator Spiritus. Veni Sancte Spiritus, sometimes called the "Golden Sequence," is a sequence prescribed in the Roman Liturgy for the Masses of Pentecost and its octave, exclusive of the following Sunday. It is usually attributed to either the thirteenth-century Pope Innocent III or to the Archbishop of Canterbury, Cardinal Stephen Langton, although it has been attributed to others as well. Veni Sancte Spiritus is one of only four medieval Sequences which were preserved in the Missale Romanum published in 1570 following the Council of Trent (1545–63). Before Trent many feasts had their own sequences. It is still sung today, having survived the liturgical changes following the Second Vatican Council. It has been set to music by a number of composers, especially during the Renaissance, including Dufay, Josquin, Willaert, Palestrina, John Dunstaple, Lassus, Victoria, and Byrd. Later composers who have set the text include Morten Lauridsen, Frank La Rocca and most familiarly to Catholics, Samuel Webbe. ↑ Liber Usualis, pp. 880-81. Solesmes 1961.